Last week I think I finally overcame that because I watched a slam that he was involved with, but not as a competitor. 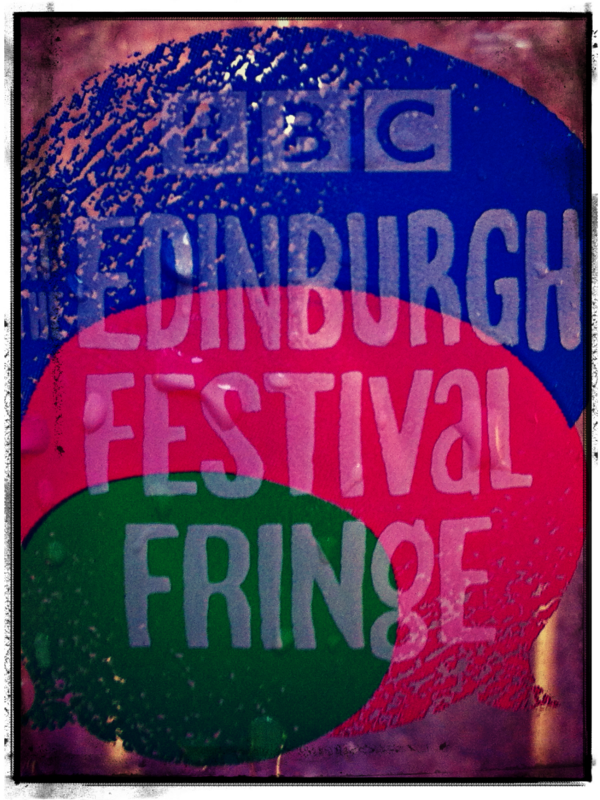 DorkyDad was hosting the BBC Poetry Slam at the Edinburgh Fringe. 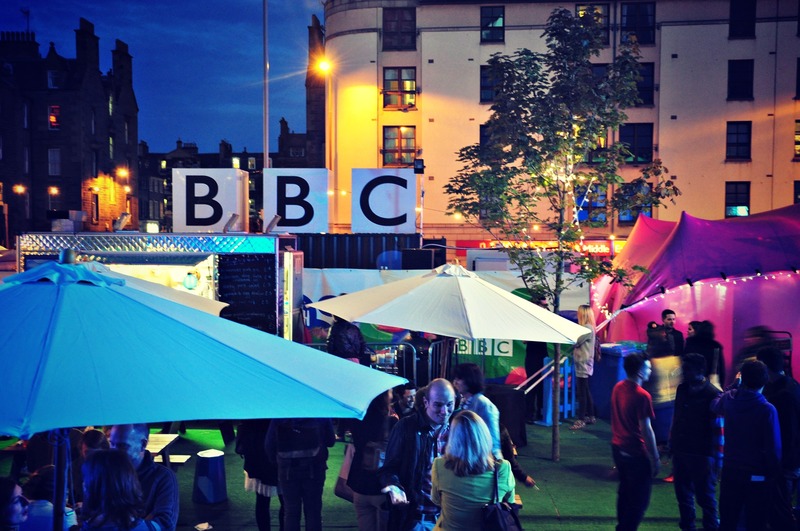 On the first four evenings that we were up in Edinburgh – Monday through to Thursday – he hosted the four heats in the wee pink tent at the BBC’s Potterrow Venue. I didn’t go to any of those, but by all accounts they went well. There was an incredible line-up of poets involved, enthusiastic audiences, and decent weather. On the Friday evening, there was a Grand Final, featuring the winners of the four heats – Rachel McCrum, Graeme Hawley, Jenny Lindsay, and Ross Sutherland. I’d seen Graeme and Jenny perform several times before. Graeme comes across as a sweet and lovely guy, who has a very dry sense of humour, and deadpan delivery that always cracks me up. Jenny is wonderful; the very best kind of young Scottish woman, fiercely intelligent and very funny, combining the political and the personal to great effect. I really liked Ross Sutherland a few years back when I saw him perform as part of Aisle 16, and although I had never seen Rachel read before, I knew of her through her connections with the (now resurrected, hurrah!) Forest Café in Edinburgh. It was interesting to see the ways that different poets dealt with their build-up. One disappeared into a corner of the venue with a fag and a pint to practice alone, one sat with friends and supporters, a couple of them showed up at the last minute, presumably to avoid having people like me sit and scrutinise them for signs of nerves. There was a lot of pacing up and down, and plenty of leg-jiggling from them all. But I will also say that compared to every slam I’ve been to before, there was an incredibly supportive atmosphere. 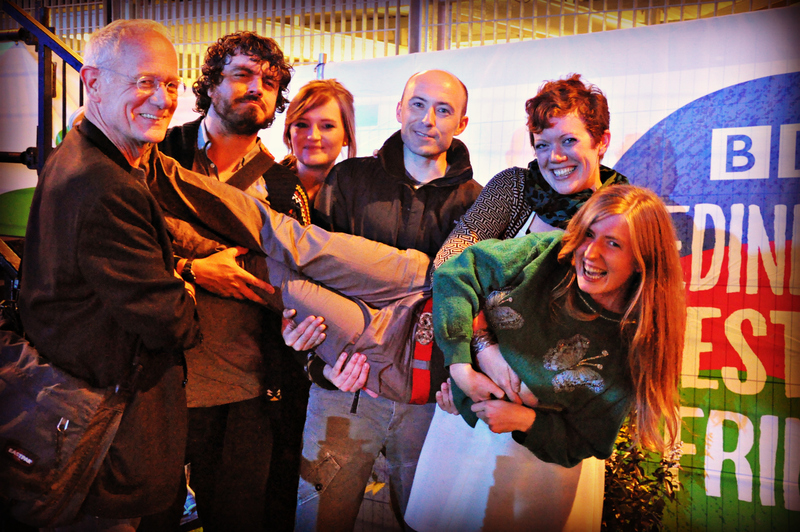 The four finalists all knew each other well – in terms of personality, performance and poetry – so there were lots of hugs and shoulder squeezes. Last year’s winner Catherine Brogan showed up to cheer them all on, as did a huge number of the other poets who had competed earlier in the week. The demand for tickets for the final was so big that it got bumped up to the big blue tent, which had 350 seats. It was a lovely venue, intimate but impressive, with great lighting and a big stage for the poets to fill. I am obviously biased, but I think DorkyDad did a brilliant job as the host. He is lucky enough and experienced enough that he always comes across as very comfortable on a stage – and that helped put the audience at ease right away, even though many of them had never been to a poetry slam before. But I was the only one who saw how much time and energy he had put into preparing for the events. It is a real skill to work hard on something and then make it look completely effortless. The poets were all incredible, and the fact that it was a difference of just 0.2 points that eventually decided the winner is testament to how strong their performances were. I did not envy the judges their jobs at all. I am super chuffed for the winner Jenny Lindsay, who is an excellent poet and has done so much to help others break into the scene in Scotland. I am thrilled that I was there to see Ross Sutherland do a wonderful, hilarious poem dedicated to a member of the audience called Sheila (and I really hope it makes the highlights video). I was stunned into silence by Rachel McCrum’s absolutely beautiful readings, and my heart broke a little bit to hear the rawness in Graeme Hawley’s voice as he read a poem about a cancer drug. I am also chuffed to pieces that almost 300 people chose to come and listen to spoken word on the last Friday of the Edinburgh Festival, and I am proud beyond words at the part DorkyDad played in that. I think my fear of slams may, finally, be cured. The top photo of DorkyDad is from the BBC Edinburgh Fringe Tumblr site, and if you click on it you’ll see lots more photos from there. This was a great post and one I’ve recommended to a couple of writer/poet friends. Would that be the same “Graeme Hawley” – the actor? Hi, no, I’m a different Graeme Hawley altogether. Wow, I so WISH I’d got tickets (although a little man projectile vomiting at home would have prevented me coming anyway). Being married to a poet must be wonderful. Someone who’s so intelligent with words. I love Mr G dearly, but sometimes he trips over his vocabulary so much he comes out with words that don’t even exist, or they’re a hybrid of two others! Great shots too. I love the top one of DorkyDad. He looks so commanding and enthused by what he’s saying. Oh bless him, I’m sure he is a wonderful husband in many other ways! It is lovely – especially when he dedicated his book to me and T – but the downside is the constructive criticism about my writing! If I write a really crap blog post he’ll definitely tell me!